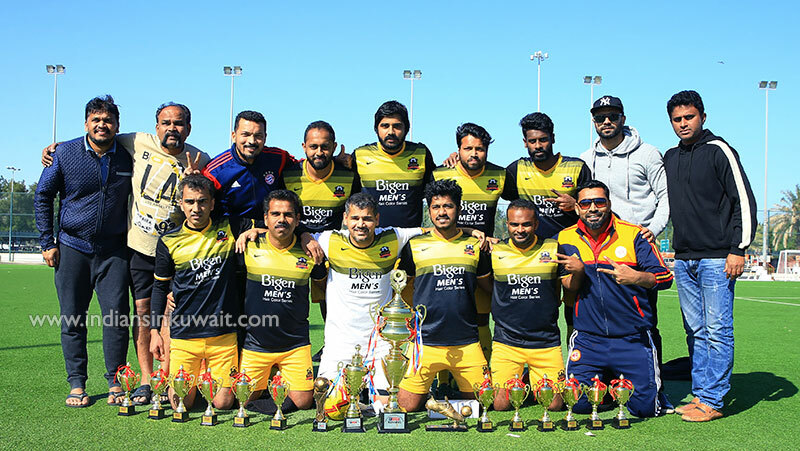 All Kerala Football Club (AKFC)-A were crowned champions of the UNIMONI Sparx FC 5th edition 7-aside football tournament held at Bayan grounds on 4TH January 2019. In an exciting final AKFC-A beat Pen Friends United 2-1. AKFC’s Jamal took the lead for the winners (1-0). But Pen Friends soon equalized converting a penalty goal through Jasmin (1-1). 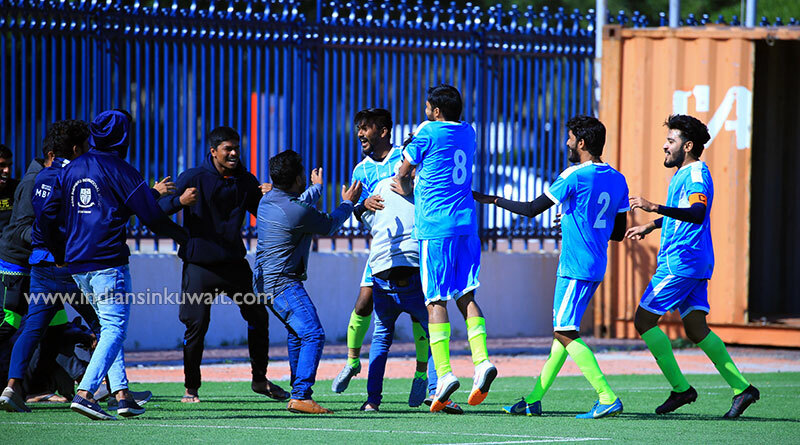 When the teams looked like heading for a draw, AKFC striker Shamil Muhammed scored a long range thunderbolt goal in injury time beating Pen Friends keeper Abdul Lateef (2-1). Earlier, Sparx President Baby Noushad introduced UNIMONI, Platinum Sponsors of Sparx FC squad for the Season 2018-19. Mr. Ranjith S. Pillai, Retail Sales Head of Unimoni was present at the event as Chief Guest. 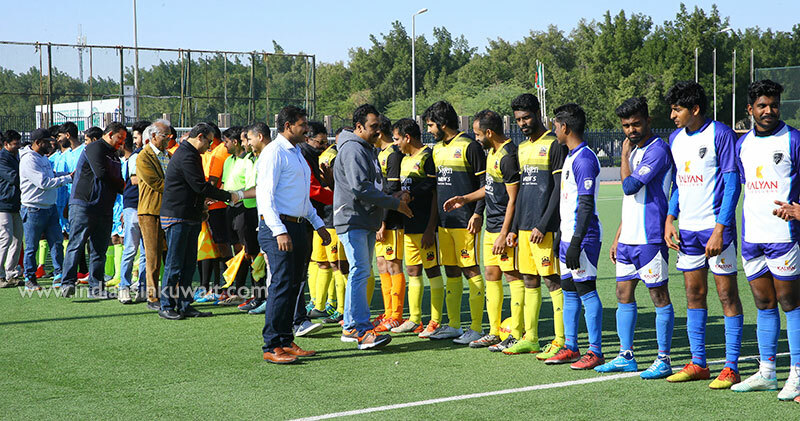 Mr. Hamza, Managing Director from Dahlia Furnished Hotel Apartments - Golden Sponsor of Sparx FC for the season was also present as well as Mr. Mansoor - Sales Manager of Grand Hyper Kuwait (Golden Sponsor for the season 2018-19), and Mrs. Shamseena - Director of Ran Energy (Golden Sponsor for the season 2018-19). Mr. Shanavas, Managing Director of Haitham Group International, Kuwait was another high profile delegate present on the occasion. Other dignitaries present on the occasion included KIFF President Mr. Derick Gomindes, KEFAK President Siddique TV, KIFF Sports Secretary Mr. Michael Pereira, KIFF Vice-President Robert Bernard, KEFAK Advisory Board Chairman Mr. Gulam C. Mustafa, KEFAK Sports Sec. SVM Safarulla, KEFAK MC Member Pradeep Kumar TKV, Mr. O.K Abdul Razak, Sparx patron Mr. Sajan, etc. In the semi-finals, AKFC-A beat Don Bosco Oratory 2-0 with Subith Lal and AKFC’s mercurial striker Inzamam scoring the goals. In the other semis, Pen Friends United beat United Goan Centre 1-0. Jasim scored the most important goal for Friends. 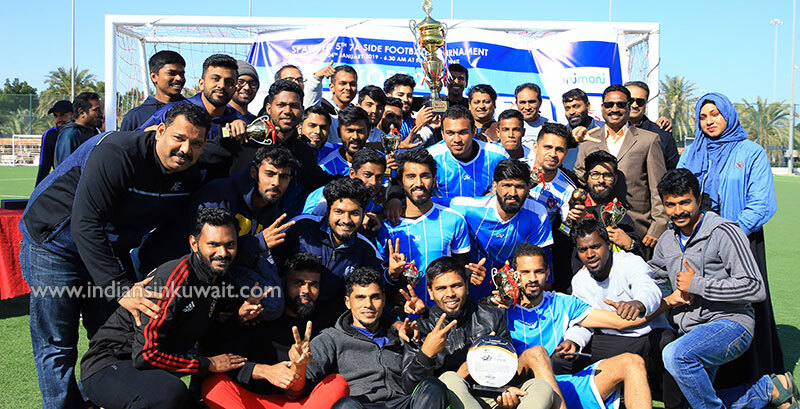 In one of the best organized tournament, a number of glittering trophies and mementos were given away. Cool winter weather and energizing spectators made the tournament equally attractive and special. Matches were officiated by KIFF referees. In the vote of thanks proposed, FC Sparx Executive member Sameehulla thanked all participating teams, officials, sponsors and everyone who rendered their help in making the tournament a grand success. Apart from trophies for Winners, Runners-up and semi-final losers, the winners and runners-up were awarded glittering individual trophies. Wonderful mementos were presented to honor Mr. Ranjith S. Pillai - Head Retail Sales from Unimoni, Mr. Hamza - Managing Director from Dahlia Furnished Hotel Apartments, Mrs. Shamseena Director From Ran Energy, Mr. Mansoor - Sales Manager from Grand Hyper Kuwait, Sameer Nasri – FC Sparx Team Manager, Kalai Vanan Krishnan – FC Sparx Asst. Team Manager, etc. The memorable mementos were presented at the hands of KEFAK Advisory Board Chairman Mr. Gulam C. Musthafa, KEFAK President Mr. Siddique TV, KEFAK MC Member Pradeep Kumar TKV, KIFF President Derick Gomindes, Bernard Fernandes - Official In-charge of KIFF, Mr. Sajan ( Sparx FC Patron), etc. Prizes were given away at the hands of Robert Bernard - KIFF Vice-President, KEFAK Sports Sec SVM Safarulla, Abdul Latheef, President of Pen Friends United, Babynoushad - President FC Sparx, Shamseena (Director Ran Energy and Shanavas VK), Hamza & Gulam Musthafa, etc. The Winners Trophy was handed over by Ranjith Pillai of Unimoni, and Mr. Derick Gomindes - KIFF President.